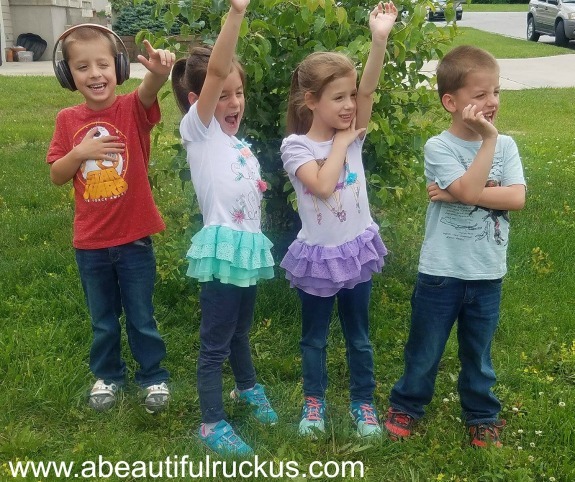 A Beautiful Ruckus: And That's a Wrap...Kindergarten Is Over! And That's a Wrap...Kindergarten Is Over! Kindergarten is a wrap. 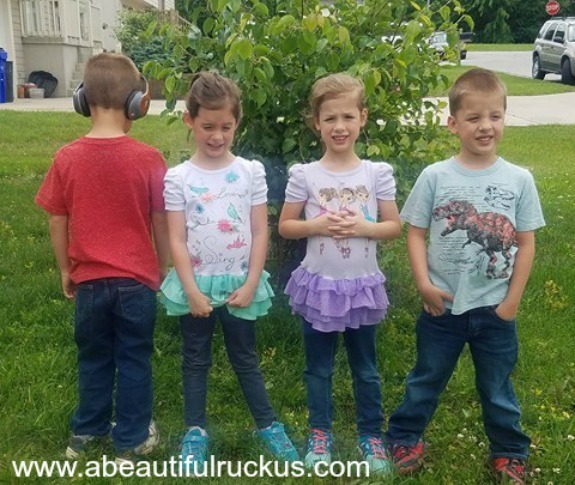 It's hard to believe that our kids are 6...kindergarten is over....and....where did the time go?? I mean, next year is 1st grade. Do all moms feel like it's bizarre when they suddenly turn around and 1st grade is on the horizon? In the quad mom circles that I run in, I now have "older quads". At our school, they have some fun countdown-to-the-end-of-the-year kindergarten festivities, (including the best day ever: pajama day) and they do kindergarten awards in the classroom instead of a kindergarten graduation. 1. The kids are completely responsible and will always get every bit of homework done without supervision along with keying all important school dates into my Google calendar for me. 2. They refuse to hang in each other's vicinity. At which point I'll probably tell them to deal with it since they were wombmates in the first place or swap around the pairings a bit. With our groupings of 2 and 2, their teachers were super gracious to coordinate the kindergarten awards between them since both award sessions ran concurrently. One teacher called two of our kids for their awards first and the other teacher called the other two kids at the end which gave me enough time to run between classrooms and see everyone get their awards. I'm sure all of the parents in both rooms wondered why I cut out early/arrived late. Lol! Such is life! Anyhow, these cuties did great, and we are super proud of them! We have most definitely had some major challenges during kindergarten, but we made it! Y'all, never in my life have I met a human with more words than this child. They say the average number of words that a guy speaks in a day is 10,000. The average number of words that a girl speaks is 30,000. Elijah has to be closing in on about 80,000 words a day...EASILY. He asks ALL the questions, narrates ALL the things, talks to himself in the 3rd person when no one else is talking to him...so. many. words. His teacher actually had to put a limit on him. He can tell her ONE thing as he walks in the door in the morning, otherwise, he just won't stop. This kid is a future politician or motivational speaker if I ever saw one. haha! The truly funny thing is that he still gets speech therapy, but that doesn't stop him at all! I think it might just be fueling his word count right along. He is very smart, so inquisitive, and wants to know why everything works the way it does. 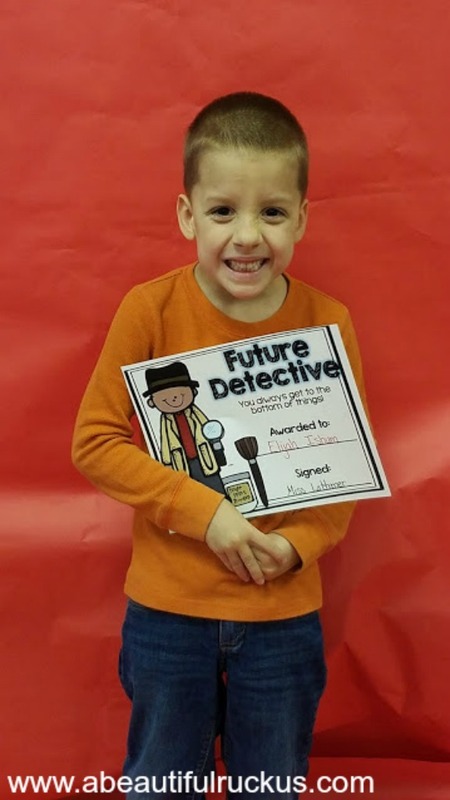 The "Future Detective Awards fits him so well!" Abby is always intent on doing her very, very best, and easily gets down on herself if she thinks there is a possibility that it could have been done better. Her social/emotional issues have been quite the mountain to deal with this year, especially since Christmas. She was tested in the fall, came back with a brilliantly high IQ, and the school removed her IEP and therapies, saying that she is no longer delayed. Sean and I definitely disagree with that, but since it couldn't be shown on paper via tests, they removed the services that she was getting. We fought long and hard for those services, and even our Pre-K teachers were floored that they were removed in kindergarten as they felt they were still needed. Since then, her anxiety has ratcheted way up affecting her at school and at home. Even going so far as to cause her to be up at night with stomach pain (It's not a physical issue. It's an emotional issue that manifests physically). She worries about so many social situations in and out of school along with her school performance (she is doing just fine.) We are trying really hard to figure out the best way to help her learn how to cope and work through her anxiety about dealing with those things. But back to her award, yes! 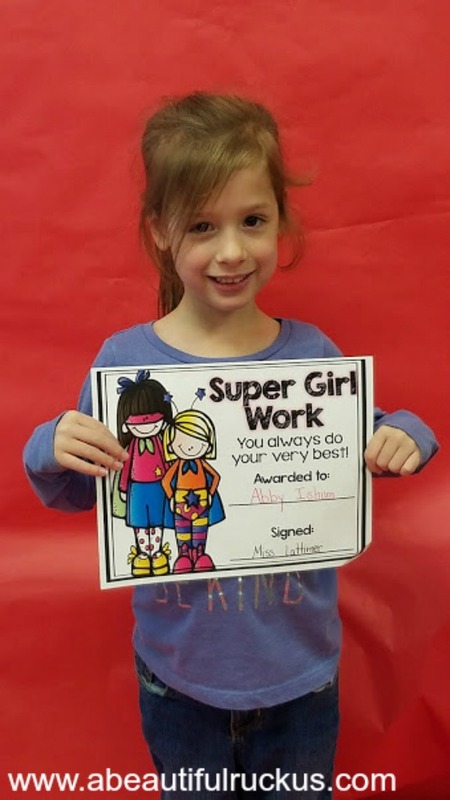 The "Super Girl Work Award" is so appropriate for her! She has and continues to overcome so much, and bring excellence to everything she works on! Everyone that Ellie has ever met has fallen in love with her laugh! I need to just give her a good tickle and record it for the blog. She is simply a RIOT! 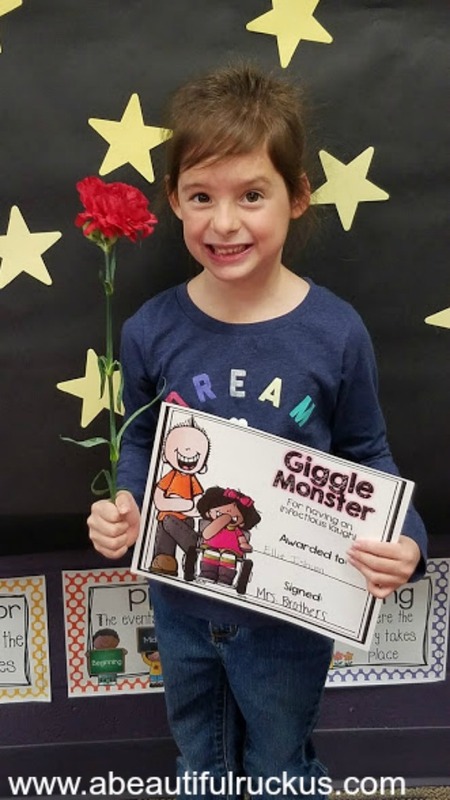 When her teacher called her name and her award, of course, the first thing she did was let out a loud giggle which set the entire room of parents into a fit of giggles too. Her teacher couldn't possibly have come up with a better award to give her. Our little social butterfly who loves being in the middle of everything...Ellie thrived in kindergarten! She's already excited to be a big 1st grader next year! Caleb...ah, this boy. We have definitely had some struggles this year. Kindergarten is a big adjustment for a typically developing kid, but when that kid has autism, it's an extra struggle. Caleb had two very good teachers who worked with him (his main room teacher and his special education teacher), and truly made some excellent progress this year! Between goal sheets, incentives, little notes congratulating him on good days (he treasures those notes! ), and patience, Caleb found a good routine by the end of the year. We did have some issues at the end with panic due to leaving kindergarten and facing the unknown world of 1st grade though. 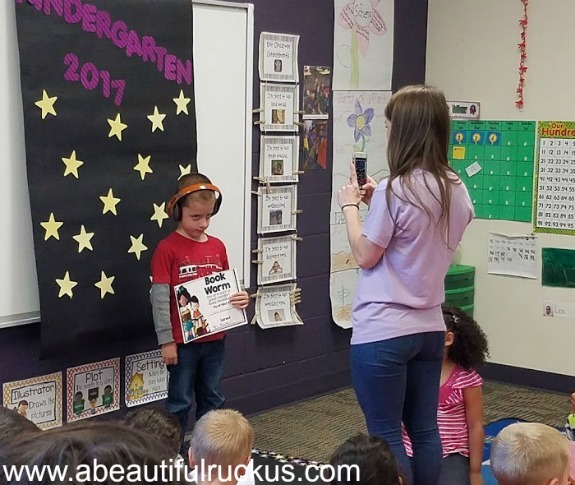 He had a bit of a meltdown during his kindergarten awards because he thought he was "never going to have fun ever again" with having to go to 1st grade. Poor guy. And then I was called to school a day or two later and ended up on the floor of a staff bathroom with him sobbing into my shirt because he just couldn't figure out how to handle the transition. Transitions are so hard, but they are part of life, so it's another opportunity to learn. His special education teacher was so great and worked with the school administration to determine his 1st grade teacher before the year ended so that he could meet her (they don't typically post classroom assignments until the week before school starts!). We now have a photo of Caleb and his 1st grade teacher, and she gave him bubbles, so life is looking up a bit! 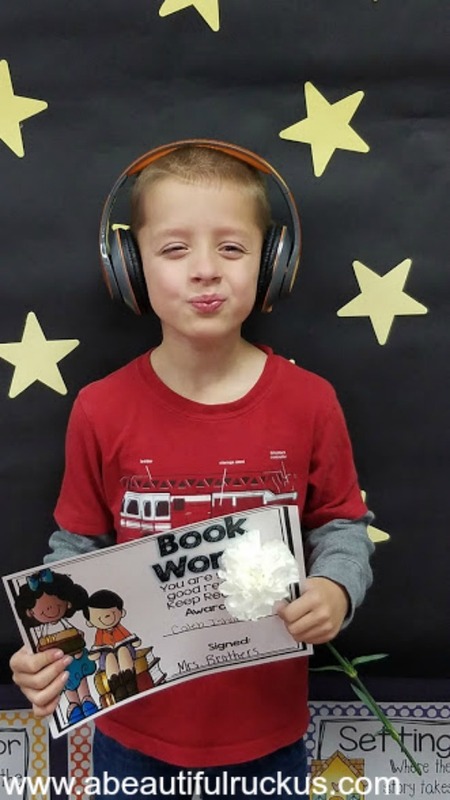 Award-wise, the Book Worm Award was just perfect for Caleb! He started reading a few words when he was 3, and entered kindergarten being able to read quite a few small words. He is now our best reader and loves being "in the know"about what is written on the paper in front of him. He has an incredibly memory, and can recall what most words say after having only been shown them once or twice. Sean and I both adore reading, and love that he has so quickly caught on to it! So that's it...we are one week into our summer vacation, and one week away from starting summer school. Caleb qualified for continuing therapies this summer, and the routine is so good for all four of them, so everyone is going. They have a 2 week break between kindergarten and summer school, 6 weeks of summer school, and then 4 weeks off before we launch full speed into 1st grade. Considering they were all preemies and developmentally delayed, we are doing marvelously well as life continues to fly by so quickly. Abby crawled into my lap tonight while we were at their grandpa's house for dinner. I whispered into her ear, "I need you to stop growing and stay little for me. Can you do that?" She whispered back, "I don't think I can..."